Back in our childhood days, when I used to return home from the playground with face and feet soiled in the puffs of dirt and grime, my mother would force me to clean up all the dirt in a tap well nearby before allowing me in home. Before I sat to study, my mother would prepare a large bowl of this tasty mouth-watering jhal muri meant to be shared by the three of us - me, dada and didi. It was almost a ritual snack in the hot and humid summer evenings. If you are health conscious, you may substitute potato with black chickpea sprouts or kala chana. It will turn out equally tasty. Dry roast 1 tsp cumin seeds, 1 tsp coriander seeds and 2 dry red chillies. Then grind them into fine powder. 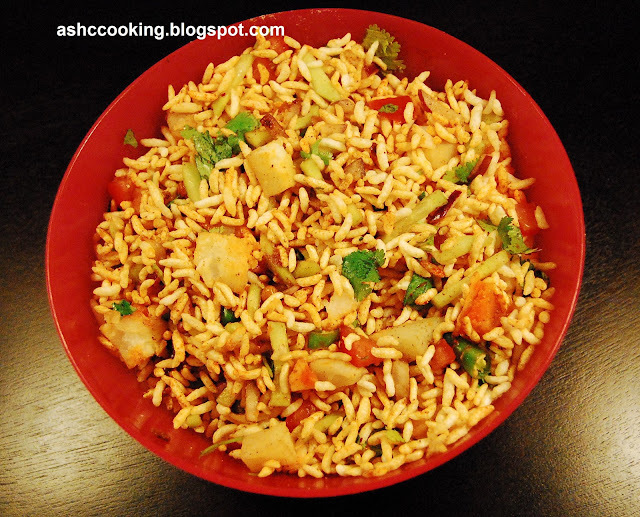 Use this masala into the jhal muri according to your taste. 1) Mix in all the ingredients together in a bowl. Sprinkle the masala powder at the end. Serve garnished with coriander leaves.